Skiboat manufacturer Spy Boats has announced that its 2010 third birthday celebration coincides with the appointment of two new dealers in NSW and Queensland. Spy Boats said the popularity of its CAD-designed boats has grown considerably in the wake and waterski community. The boats, which are locally-built by Performance Marine and Whittley Marine, were awarded the AMIF Ski Boat of the Year in its first year of production. Spy Boats recently announced the appointment of Blakes Marine in NSW, and Broadwater Boating Centre in Queensland. Peter Webb from Spy Boats said he was excited about the brand’s future. "Our main priority in appointing dealers has been to ensure that they are quality dealerships, run by quality people, who importantly, deliver excellent sales and service to the customers; and they have a knowledge and love of the wake and ski boat scene," he said. "We’re extremely confident that both Blakes Marine and Broadwater Boating have all of the credentials we desire to represent the Spy Brand and take it forward." Blakes Marine is run by former powerboat racer and watersports enthusiast Alan Blake and his wife Anne. Blake said he was equally excited about being incorporated into the Spy Boats network. "We have been looking for a while now for a top quality, Australian-built, cross-over watersports boat and we’re certain Spy Boats are exactly that," he said. "Our children Lee and Yanna, who both work in the business, are very keen watersport people, and Yanna’s husband Brenton Crouch is a champion Australian barefoot trick-skier, so I know we have the expertise and the enthusiasm to be an integral part of Spy Boats success." Alan Peters from Broadwater Boating Centre was equally enthusiastic. "Spy Boats is a great addition to the current range of boats we have at Broadwater Boating Centre. I’m sure the quality and the choice of boats that Spy offer, combined with our experienced sales and technical staff, will mean we’ll see a lot more Spy boats on Queensland’s waterways in the very near future," he said. These appointments, said Spy Boats, mean there is now only one piece missing in the Spy Boats network. 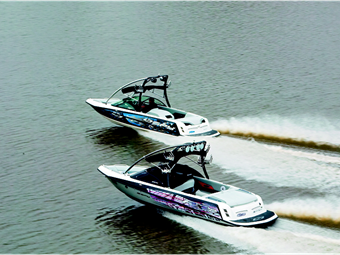 "We’re actively looking for a dealer in South Australia that’s equal in standing to all of our other dealers around the country and who has a love of the wake and waterski industry," said Webb. "We have some very exciting plans for Spy Boats, with two new boats currently at the R & D stage along with the potential of some limited edition runs," he said. The Spy Boats range currently consists of four models: the RX22, RS22, TS21 and XS21 models. New models are also said to be under development for launch at the Melbourne Boat Show. Visit www.spyboats.com.au for more information.